Globally, postharvest losses and food waste are estimated at 30 to 40% of production. Losses of perishable foods such as fruits and vegetables can be even higher than those for staple foods during the postharvest period, depending on the weather, access to storage or distance from markets. Utilizing improved postharvest practices often results in reduced food losses, improved overall quality and food safety, and higher profits for growers and marketers. 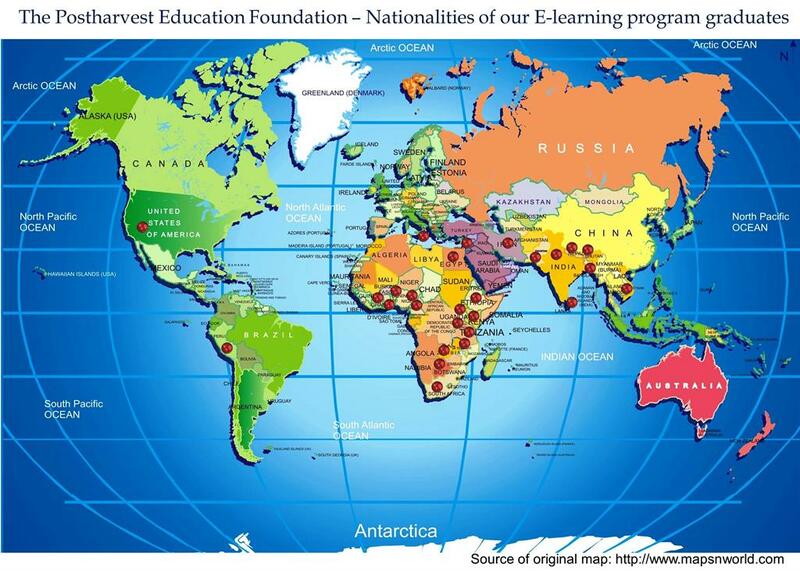 The Postharvest Education Foundation’s mission is to provide innovative programs that motivate and empower people to reduce food losses and waste. Conduct a variety of postharvest e-learning programs for young professionals who work with small-scale farmers in developing countries. Provide free access to postharvest training materials for those who are involved in extension work and training of farmers, produce handlers, small-scale food processors, and marketers. Supply postharvest tools and basic equipment for use in applied research and for improving practical field operations. Organize postharvest workshops for e-learners who successfully complete their online programs. Offer long-term mentoring for participants in e-learning programs via social networking websites. Conduct short courses, study tours, and workshops. Sponsor postharvest events and conferences, travel and awards. Provide advice and guidance for establishing local postharvest training centers. Established in 2011, we are currently registered as a public charity in Oregon, California, Alabama, New York, and New Jersey, and exempt from registration in many other states. 501(c) 3 status was granted in August 2013, so all donations are federally tax deductible. The Postharvest Education Foundation is a nonprofit public benefit corporation, organized and operated to engage in any lawful activity permitted by Section 501(c)3 of the Internal Revenue Code of 1986, as amended, and the Oregon Nonprofit Corporation Act. Member of the SAVE FOOD! Initiative sponsored by the UNFAO. A sponsor of the Africa-wide Postharvest Food Loss Prevention Conference, 28-31 March 2017 in Nairobi, Kenya. As of 2018, more than 150 PEF graduates are working in 28 countries around the world.